Crashes and Dashes. Amy Bennett, hit the pavement hard during a metric century bike race on Oahu. Impact resulted in a broken clavicle and abundant road rash for the Warrior Princess. Best wishes to Amy for a speedy recovery- Please! A shot from the archives of Amy and Mike Fereirra comparing contorted clavs.. Amy likely now to claim the honor. Shonny Vanlandingham showed how the west was won, with victory at the XTERRA Western US Championships. Shonny edged all other top seeded pros to include Melanie McQuaid – most significant in this “gauging” race for the 2010 season. Shonny reported that she felt great to break out with a win in the first major US XTERRA race. Winter training in Hawaii paid off big dividends, especially in the Nevada sun. Major efforts from Paddling Phenom, Anna Mathisen. In the midst of completing in three channel crossing races, Anna earned 1st and 2nd place AG victories in the earlier efforts. 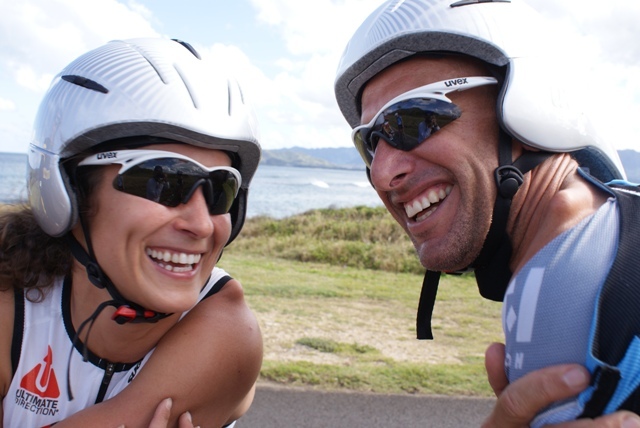 Anna will be accompanied by her dashing Brit Mate Andy this weekend, as they compete together in the Molokai OC1 Relay race. “Bring it on” says Ms Anna. 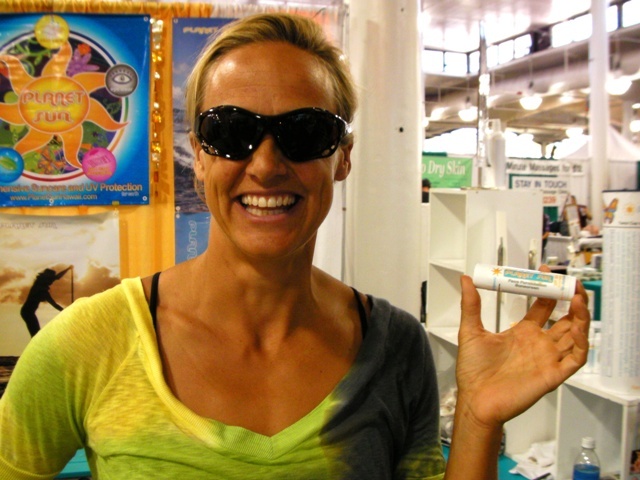 Anna took a rare pause from her perpetual paddling efforts to join me at the Hawaii New Product Show Expo on Sunday. Aside from engaging 20K show goers, Anna starred in a video for Planet Sun sharing stories at sea and demonstrating our suncare offerings. Video to be featured at www.standuppaddlesurf.net in near future and sure to go “viral”. A pic of Anna clad in PS gear. Leaving you now with Anna’s own account of her latest efforts. Great stuff. Enjoy and Go Long, Go Strong, Go Protected in the Sun!!! Record breaking conditions for the ladies division this year. My first crossing last year was in a head wind for 6 hrs 56 mins. This year served up fast downwind surfing and I completed in 4hrs 56 mins. 7th overall the ladies, 1st in my AG. I suffered a bit of mid channel nausea, caused by I think, think nutrition choices or possibly that I had been paddling my a%^ off with a heart rate between 160-180 for 3 hours. Was so stoked on the whole experience, I shipped my boat off to Maui 2 days later and did the 26 miles maui to Molokai solo in 3 hrs 30 something getting 2nd in my AG. Lacked a bit of umph but it was awesome with perfect easterly winds and a nice up close whale sighting.